The Importance of Leaving Word Before Heading Into the Wild. Let someone know where you are going before you head into the wild. Photo: Paul Kirtley. Nobody heads out into the wilds expecting to be the recipient of a search and rescue operation. Most people think it will never happen to them. But you only need to Google ‘lost hiker’ or ‘missing hiker’ to get a sense of how many people for whom it becomes a reality. The next time you head out into the wilds, what will happen if you don’t return home when you planned to? Will anyone miss you? Will anyone know where you are? How long will you have to wait before someone raises the alarm and searchers mobilise to start looking for you? This is only a training exercise but what if it happened for real? Photo: Paul Kirtley. It’s always wise to leave word with someone. I can’t think of a situation it wouldn’t be. At the very least you should be telling someone responsible where you are going and what time you expect to be back. Beyond that you should agree with them at what time they raise the alarm (e.g. 2 hours after you are due back) to allow you some contingency for being delayed. But also, if you slipped and broke your leg at 13:00 and you know that someone is going miss you at 17:00 and going to call you in as missing at 19:00, then it gives you a good deal of comfort. Your trusted person doesn’t even have to be geographically near to your finishing point. You can give them the details of your trip by phone or email for example and agree to call them when you return. Note that I use the words responsible and trusted to describe who you should leave details with. Leaving word, in itself, won’t get you rescued. The person you trusted has to raise the alarm for anything to happen. Leave Details of Your Route. The more details you can leave about your intended route the better. If people searching for you only know where you started, they are potentially left with a surprisingly large area to search if you fail to return: Assuming you headed out for an overnight camping trip and walked up to 10 miles (16 km) the first day then at the end of the day you could be in anywhere in a circle of 10 mile (16 km) radius of your start point. This is an area of 314 square miles (over 800 square km)! Any information you can leave about your intended route, or even the location of your intended camp, will narrow down any search area and speed up your rescue. You can go one step further and leave a route card. A route card is a good planning aid, particularly for the relatively inexperienced. It allows you to plan a route from a map and note down significant features, grid references, bearings and estimated timings. The latter point is an important one: people often overestimate what they can achieve in a day; sitting down before you set out and properly calculating how far you can travel along your intended route may well just avoid you biting off more than you can chew. This alone will make for a safer and more enjoyable trip. There are some criticisms of route cards. One is that it has little value in communicating a planned journey to other people. I disagree. While there are more visual ways of communicating your route to another person, for example a map with the route drawn on in it, you can still piece together someone’s route with route card information. It just takes a little longer to assimilate the information. Faced with searching for someone, with no other information, a route card could be invaluable. But only if they have adhered to their route. This brings us to another criticism of a route card – that it introduces a lack of flexibility into your planning. What if things change on the ground? Even if you don’t use your own route card, parks (Algonquin Provincial Park for example) often require you to specify which campsite you will be using or which lake you will be camping next to. 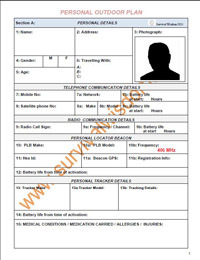 When you complete the form at the park office, you are effectively creating a high-level route card which outlines your route. So I think the answer is a happy medium. Particularly if you are on a multi-day trip, you can give high-level details of direction, intended route and what area you intend to spend the night. This gives you the freedom to vary your route depending on conditions, explore off your route a little, stop short of your intended campsite or go a little further if you are feeling good. The important thing is that someone knows broadly where you intended to be on a given day and where you were heading next. Moreover, you should never feel so constrained by your plan that you can’t roll with the punches while you are on a trip – you should have the flexibility to modify the route in view of the conditions prevailing at the time. Whether or not you choose to use a route card, you should certainly plan your route. Studying the map closely will allow you to visualise the route and identify potential obstacles or problems. As mentioned above you should think about how far you can realistically travel in a day. Consideration should be given to the terrain, the fitness and experience of the group, the likely conditions for the time of year and the amount of daylight available. You should also look for and make note of potential escape routes in case you need to abort the trip early. You should also think about what can go wrong and the likelihood of it happening – basically you are doing a risk assessment. If you aren’t happy with some of the potential risks, maybe you have to reconsider your route (to avoid a river crossing for example) or even the trip’s objectives. Make sure you have the equipment and training necessary to deal with emergencies. Apart from rescue gear specific to your activity, this typically boils down to first aid kit, communication devices and signalling devices. It’s best practice to leave details of this equipment with your trusted person back at home. Then anyone who has these details knows your capabilities and your limitations. Knowing what type of device you are trying to signal with will potentially speed up your rescue. A very welcome sight if you are in need of rescue. Photo: Paul Kirtley. You should have an emergency plan for the contingency that you need external assistance. It could be as simple as calling the emergency services with your mobile phone, staying put, putting on warm clothes, getting into a survival bag, drinking warm drinks from a thermos flask and waiting. But at least you will have thought it through. It may even prompt you to remember to pack an extra warm layer or even a survival bag. Leaving details of your emergency plan with your trusted person means your actions will be more predictable to any searchers – they know what you plan to do in an emergency. You need to have a method by which you don’t forget any equipment before you head out on your trip. A kit list is an obvious and effective way to do this. Just tick off the items as you pack. Not only that, a kit list is a great planning tool: Compiling a kit list forces you to be more systematic about your choice of equipment; it also makes you rationalise why you are taking something or leaving it out. Furthermore, if you leave your kit list with your trusted person, should the worst-case scenario come about, search and rescue personnel will have a very good idea of how well equipped you are. The Personal Outdoor Plan – Enter Chris Smart. I first met Chris Smart while I was assisting on a tracking course in 2004. Chris introduced himself as an RAF survival instructor. He has an impressive CV. Chris has taught survival skills for around 20 years now and was the chief instructor at the UK joint service survival school. He has taught survival techniques in temperate, arctic, jungle, and desert regions and has trained personnel from the UK and NATO military as well as other forces world wide. Chris now spends a lot of his time researching new equipment, testing and evaluating it and then developing training to maximise its use. He is part of the Survival Wisdom team who mainly prepare corporate clients, and volunteer organisations, for travel to remote areas. Chris has developed a document called the Personal Outdoor Plan (POP). It captures all of what I have talked about above and more. It is a brilliant format to record all the information you could ever want to leave with a trusted person before you head out on a trip. I’ve created a page for The Personal Outdoor Plan, or POP, and from there you can download it for free. There is an example completed form with guidance notes as well as blank POP forms in both PDF and MS Word formats. Im pretty good when i leave for a days hike. I tell 2 of my friends & my Dad. I tell them the lengh of hike & how long i should be. I alway take my cell phone, fully charged. Also in my pack i have at least 5 power bars a zip lock bag of peanuts,2 litres of water & 500ml of Gatorade. Fully stocked First aid kit. 100 ft of para cord, a 6×8 tarp, folding saw, small hatchet, lots of fire lighting methods, compass, i could go on with the items i always carry, lol. Cheers, Dave. Good to hear from you. I think the potential for having to spend a night out is often overlooked by day hikers. A few items such as a tarp or a survival bag and the means to light a fire are all you need to spend a relatively comfortable night out in the woods. It sounds like you go out very prepared. This was a very good informational post with nothing but truth inside it. I agree and quite honestly I always carry a cell phone with me and a survival pack plus i let my wife know where I will be. Hey Rick, good to see you back here. Thanks for the comment. Excellent advice Paul, and so simple yet still people pour scorn on this type of advice, either thinking it won’t happen to them or thinking it is Soft to act in this way. I have friends in DORSAR Dorset Search and Rescue, a voluntary search and rescue organisation, they will tell you how much easier their job would be given the kind of info you talk about. And you don’t need to be miles from civilisation to get into trouble, people have died in sight of their home or in public parks. Thanks for your comments – you’ve added some good advice. It’s a small world: I also have friends in DorSAR. 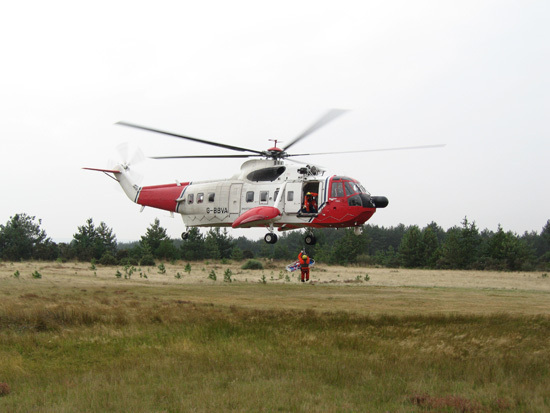 The picture of the Coastguard helicopter in the article is actually from a DorSAR training exercise I was involved in a few years back! Always Leave a Route Card with projected times on it. Good Article that most people forget about. yet its probably one of the most important things to remember. A great article. However its a shame that very few people actually do it. I reckon if people had to fill something like that out everytime they go for a hike it would soon fall by the wayside. 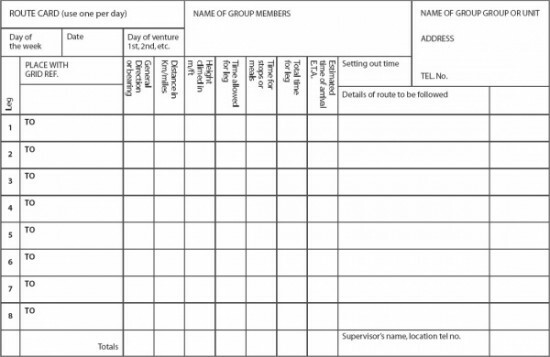 New walkers would feel overwhelmed by having to fill out a multipage report. I think something very detailed is only needed for long trips in the wild. For a day hike if pople give a short descriptive plan and stick to that plan its better than nothing and more likely to be done. Heading to top of mountain “A” via tourist path. Will be back before 5pm. Often people forget emergency gear because nothing has ever happened to them, myself included. Thanks for your comment. I agree – day hikers will be put off by having to fill out a big form. But at least leaving details of where they are going and what time they aim to be back is better than nothing. You can do this with the POP or another format. The important thing is to remember to do it. These days there are several PLBs markete towards “the rest of us” (e.g. SPOT). What is your opinion on these, in particular in relation to POPs and more traditional route messages? My view on the various beacons and locators available is that they can be useful in saving lives if used appropriately. By appropriately I mean as long as people don’t neglect to take more traditional measures to be careful in wild places, and as long as people don’t call for rescue when it is not really needed. One downside of many people carrying mobile phones in the mountains in the UK is that help or rescue services are being called because it is possible rather than necessary. An interesting and somewhat more philosophical question about the use of technology in the outdoors is how it changes people’s attitude to risk. And if you carry all of this emergency signalling equipment, do you gain the same sense of adventure or self-reliance? Personally I like the sense of self-reliance in being responsible for my own outcome when I’m alone in remote places. But if I’m leading others, and responsible for their safety, then I take the view that I should have the technology with me in case of emergency. Your attitude (“responsible for my own outcome”) matches mine fairly closely, which is why I have been thinking about them quite a bit. I’m currently at the stage of internal debate where I feel that they are a usefull last resort, kind of analogous to the ejection seat of a fighter pilot; it is there to be used, but only if there are no other realistic options available (and it is perfectly appropriate for someone to ask *why* you choose to use it). I’m thinking about getting one, because it would allow me the freedom to roam on a free, unstructured basis, and still have an option in cases of (e.g.) a broken leg. 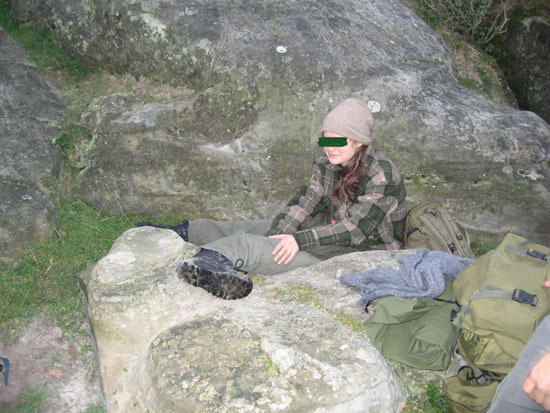 The overuse of mobile phones being used for “silly” reasons is an issue, and unfortunately I think there has also been cases of PLBs used in situations where a modicum of bushcraft skills would resolve the problem. thanks so much for your tips and your site, I really appreciate the help, experience & advice. regarding the article, I like the route planning, it seems surprising to me that people would think it a bad idea, it’s very similar to a flight plan filed by both professional and private pilots. And also saving emergency services time is so important as it obviously costs money the longer they’re out and also, they may be being distracted from saving someone else. I personally believe we are all responsible for our own actions and knowlege with hands on learning and practise is important, so often i have seen and met people who have ventured into the mountains and Forests in Scotland with Little or no gear other than a sandwich from the garage, a small bottle of water, a Kagoul and Trainers and at times I have had to help them off the Hillside. This as you have pointed out demonstrates a lack of Knowledge and over estimation of their abilities in the great outdoors. I must admit i do embrace technology where i feel its practicle and i do carry a “Spot” device for that just in case moment, or I come across an incident on the hillside. This does not detract from the information left with family members of the area and route being taken during a trip. Mobile Phones etc can not always receive a signal especially in Long Narrow Glens and if the worst were to happen I would like to know that i could reach out sooner for that help rather than Hours later after missing a check In with your nearest and dearest. It is also good for letting people know you are ok and exactly where you are if you want during your trip especially if traveling solo, however you are correct in that these types of devices may be abused by those who lack Knowlege and experience and there is no easy answer to incidents like these other than the Education of People who want to enjoy our wonderful wild places however they need to be prepared to seek it out and take responsibility for themselves and the enviroment they intend to explore. Thanks for leaving such a great comment! We are all responsible for our own actions. Unfortunately modern technology is in some ways a curse as well as a blessing. It is harder and harder to gain that sense of isolation and independence that many of us crave. Equallly it creates a false sense of security for those who head out ill-equipped, whether naively or irresponsibly. I too have met people woefully ill-equipped to deal with the prevailing weather conditions. 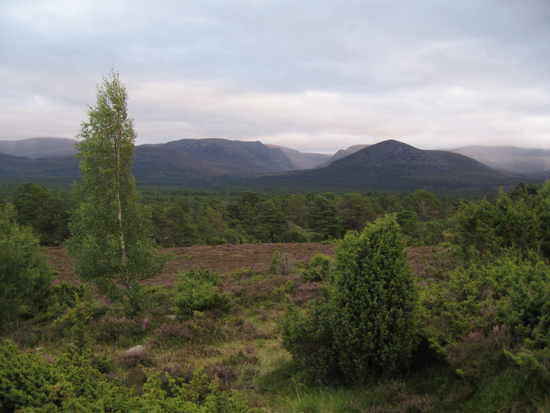 I have a particularly memory of being just north of Ben Macdui, stopped for lunch towards the end of a 4-day trip in the hills. It was April and a cold, windy day. We were well clothed and had a stove going, heating some packet soup for lunch. As we lunched we watched people wandering across from the direction of Cairn Gorm, dressed in trainers, jeans, and casual jackets. I remember a particular couple who looked at us like we were weird, only to see them scurrying back from the slopes of Macdui not long afterwards, hands in pockets and the guy having wrapped his girlfriend’s shawl/scarf around his head. Both had pained expressions on their faces and looked cold as they double-timed it back (presumably to the car park below the Ptarmigan restaurant). Even in light of the capabilities of modern technology, the simple act of letting someone know where you are going seems like a happy medium between independence and responsibility. Great article and one I have in the past ignored especially on short day trips decided yes it’s a nice day going for a wander in the hills and told no one. Will make sure in future that I do as just as easy to get in trouble on a 4 hour trip in the hills as a weekender. •	what will happen if you don’t return home when you planned to? My husband will start hunting for me. •	Will anyone miss you? My husband; quite likely my friend Fiona too. •	Will anyone know where you are? Probably only roughly. It depends where I am. I like to be able to be spontaneous and wouldn’t bother to go out at all if I had to fill in a set of forms (in triplicate!). People know where I’m based and have an idea of where I’ll be walking but not details. •	How long will you have to wait before someone raises the alarm and searchers mobilise to start looking for you? That depends – if I’ve gone out for a week’s walking and get stuck/hurt before the end of the week then I’ll have a maximum of that many days before anyone starts looking for me. I go out with emergency kit – whistle, mirror, fire-making, (my mobile for whatever that’s worth! ), first aid, enough clothes, food, water purifiation, bivy, sleeping bag, tarp/tent, etc – but I know I can get hurt, break a leg/arm, sever an artery (not much hope if I do that!) or just sprain an ankle. That dependence on myself and my in-tune-ness with nature is part of the reason I go. I do try not to be a nuisance to the emergency services! On the other hand, I can get ihurt going 4 miles down the road to Tesco’s – I did once when some nerd ran over my walking stick (fortunately not me) before I became bionic. I had to sort it all out for myself as my husband was away in London for the week and I otherwise live alone so nobody (except the cats) would miss me. My point being that it’s just as possible to get into trouble in your home town as it is in the Cairngorms or the middle of Exmoor. These questions are only uncomfortable if you’ve not thought it through already. Your article, Paul, is at least getting people to do this. Excellent cautionary advice. It’s something my wife and do without failing whenever we head out into the bush. The person (or persons) you choose to give your route/travel information needs to know where you are and most importantly when you will contact them. Who you choose is important. It has someone who will regard it as a sacred trust so that they will, absolutely, and without fail, call for help on your behalf if you DON’T call, write or otherwise notify them that you’ve back out of the bush. The principle is “No news is BAD news”. This is something we have mentioned in a few of our videos about off-trail hiking on Crown lands. When you’re off the beaten paths, one’s chances of being found if you’re lost or hurt are vanishingly small. I was always brought up to say where I was going and when I’d be back. I apply that to everything I do whether it is just nipping out for a pint of milk to a multi day hike in the Trossachs. It makes sense to do this but it’s a surprise how few people actually do it. Even when I was living on my own as a Student I’d always call at least one of my friends before I set off. As always though solid sound advice there. It’s good to hear from you. Yep it seems common sense to me too. BUT I’ve noticed that people are less likely to leave word if they are “heading out for only a short while”…whereas people are much more careful to leave word if they perceive the trip as serious. On the flip side of this is that people tend to be less well equipped for short trips, particularly day hikes. Good article — thanks. As a recent subscriber and now a commenter here, I’d like you to know I’ve been enjoying your blog very much so far. Before leaving our vehicles in the parking lot and heading out for the class, the instructor addressed the potential importance and helpfulness of leaving word for others in the form of notes or other information in our vehicles. He urged us all to do so whenever we left our vehicles behind to venture out into the wilderness. He asked our thoughts about where on the vehicle to leave our notes — under the windshield wiper, on the dashboard, taped to the window, on the seat, etc. His recommendation, emphasizing the wisdom of not making our vehicles targets for thieves or burglars, was to leave our notes concealed in the console box or glove compartment, adding that SAR members are trained to look first for notes in those places. I did not know that, but it makes sense and could be very helpful, especially when time is of the essence. Any thoughts about leaving notes on vehicles before venturing out…? Thanks again for subscribing to my emails and welcome. In particular thanks for your comment here. It’s always good to undertake training in realistic and relevant contexts and it sounds like your day on the PCT was very worthwhile. In answer to your question about article dates – the year of publication of each article is in the URL (web address) of the article. I don’t put the actual publication date on the articles as this is not a news site. It’s a conscious decision on my part. We are conditioned into looking for new, fresh information. Yet, as you will know, the information for keeping us safe outdoors does not change much, if at all, from one year to the next. I found that people used to discount my articles more if they were older even if the info as relevant now as it was a couple of years ago. Hence, I stopped including the exact date of publication. Most of the emails you’ll receive from me are about new material – articles, videos and podcasts – being added each week. But some of the emails will point you to useful, almost timeless info on my blog that would otherwise go unnoticed. I want to make sure each subsrciber – whenever they join this site – gets as much value from it as possible. With respect to leaving a note on my vehicle, I definitely would not leave a visible note on or within the windshield, for fear of my vehicle being broken into. I wasn’t aware that SAR members in the USA were trained to search glove or console boxes. I’ll ask my SAR friends here in the UK and Europe if they have similar protocols. Of course it makes sense to look for information but I suspect it would take time to ascertain a vehicle was yours (the search recipient) sometime after it was found, which presumably would be sometime after the alarm was raised. I would say it’s still better to leave word with someone who will raise the alarm in the first place but, given the non-linearity of life, not without value to leave duplicate information within a vehicle. Thanks for the prompt reply. I now see the year included in the URL. Thanks for pointing that out. Funny old thing I was talking about this very subject this yesterday ! I read somewhere that there isn’t any need for survival kits and the EDC type kits in the UK as we are never more than 10 miles from a well known burger franchise! 10 miles with a even slightly sprained ankle ! Can you imagine the pain and anxiety ? Yet just by telling someone the duration, route and your general where a bouts as well as carrying a bit of extra kit as its seems most of us do can quite literally be the difference between life and death ! I personally carry a light weight tarp, trekking pole, first aid kit, survival bag , fire lighting aids alongside my water and a fully charged phone enough snacks to feed the five thousand and the ultimate survival food that fits anywhere! BOVRIL CUBES !! Fantastic, informative post Thank you. Thanks for your comments Russ. You certainly have the right perspective. The most important thing in your “EDC” in the great outdoors should be an emergency shelter (tarp, survival bag, bothy bag, etc., as appropriate), comms/signalling kit and some fire kit/stove as appropriate. And indeed, telling someone (responsible) where you are going, will ensure a search – and take some of the stress out of the emergency. Superb topic, which could not have been posted at a better time. Although i do pretty much everything you have advise, I also have an app on my phone that allows people to track my exact location via GPS. Why was this topic posted at the best possible time you may all ask. he has read this current post and said no it was not a good idea and i am amazed he actually contacted his friends to tell them no and why. They are now not going camping in an undetermined locations and hopefully will sign up to your blog. Thanks for sharing this story. I’m glad your son found it useful too. I hope it doesn’t deter him completely from camping but, rather just makes sure he lets you know where he is going and when you should expect him back. Take care and enjoy the outdoors. Gladly it has not put him off of the idea of camping. If fact, he has asked if i was to come along and keep a safe distance from him and his friends, could they still go. Excellent article. I am a get outdoors junkie. This is something I always do. You just cannot be too careful. I always have a “things bag”. In my pack to get me through 72 hours.